Anthony Mouchantaf loves to golf! 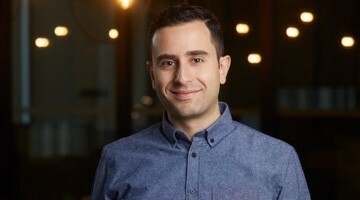 In his role as Associate at OMERS Ventures, Anthony Mouchantaf is responsible for researching and executing on investment opportunities and supporting portfolio companies post-investment. Well, I followed a relatively unorthodox path to OV. My academic background is law and business; and I went to law school mostly because I was interested in American constitutional law. While in law school I spent some time doing human rights work at the U.N. headquarters in New York, followed by a 180 and a foray into corporate law. Serendipitously, while we were still in school a close friend approached me with an idea to start a company. That became Rthm Technologies, a mobile health and consumer genetics company. I decided that practicing law in New York wasn’t for me, and instead proceeded to couch surf for a few years here in Toronto. By 2016 our products picked up steam around the world, and at various times we became the top ranked health app in the Apple App Store in 26 countries on 5 continents. We sold that business last year, and I moved over here to OV! …So, you’re a lawyer-turned-entrepreneur-turned-VC. How do you think your former experience will benefit you as a venture capital investor? I think a lot of it comes down to empathy (in a real sense) and situational experience. In 2014 my co-founders and I started with an idea, a PowerPoint presentation, and zero startup experience. Over the years we brought products to market that were used by millions of people around the world and we took our startup from St. Catherine’s Chapel (story for another time) to an 8-figure private market cap, before selling the business to a publicly-traded company. So I’ve seen it all, from the highs, to the lows, to staring into the abyss wondering what the hell you’re doing with your life. That helps me to better understand and situate a founder’s challenges — on many levels — and to support them when they inevitably encounter the trials and tribulations that come with scaling a business. Ultimately, as VCs we are more than investors, we are partners and advisors to the founders that we back. What are your main investment areas of interest right now? I’ll usually get excited around consumer-facing companies, it’s my background and where I have the most experience. I think VCs in general tend to be somewhat lukewarm on consumer tech; but when you know what to look for with respect to product-market fit, the founding team, and growth, you can build scalable, highly defensible, and predictable consumer businesses. Beyond that I have a natural bias and excitement for civilizational-type tech; things like quantum computing, space tech, and AI. If I wasn’t a VC I’d be studying history. The unlikely ark of our story as a species — and where we’re going — absolutely blows my mind. Supporting brilliant founders and having a front row seat to projects that could literally change the course of history will spring me out of the bed every single morning. Harlow Giles Unger’s biography of Lafayette.